While the City Council's "Call for Review" of the mess known as 610 Baldwin Court has been pooch punted into next year, Tuesday evening's meeting still has an item of great importance (link). The "Review of the General Plan Update" is on the agenda, and that long delayed yet key piece of the governmental design of Sierra Madre will move yet one more step to completion. And when exactly will that completion happen you ask? Nobody quite knows for sure, though two years has been cited by some. More or less. This whole "General Plan Update" effort began in late 2009, with the first version of the committee to accomplish this effort being seated in 2010. It was supposed to take a total of 18 months to complete. Yet due to the endless cancelation of meetings, odd and at time inexplicable delays by city staff, plus the open hostility to this update by certain of our more awful City Councils (Nancy Walsh's "We'll take you out" tirade * link * being an eye opening peek into their at times bizarre behavior), turned this 18 month updating process into nearly 6 long and frustrating years. With two more yet to go. Perhaps. They're not sure. And yes, there are consequences. Severe ones. The difficulties at One Carter would have to be among the foremost of them. Because had the updated Land Use Section for this latest iteration of the General Plan been in place back in 2011 (instead of two years into the future ... maybe) the difficulties we are having with CETT today wouldn't have even come up. The necessary land use guidelines would have been clearly drawn and in place, and what they are attempting to legally force us into accepting now could have been brushed aside so easily that CETT probably wouldn't have even come here in the first place. Should the 610 Baldwin Court matter end up going to trial, which in my opinion it will, and should we lose, the legal costs to the taxpayers of this town could be in the hundreds of thousands of dollars. And should we lose that lawsuit we would not only have to pick up CETT's legal costs as well, but could also be forced into relinquishing planning control over the remaining open foothill areas on the north side of town. Resulting in an out of control McMansionizing of the most visible (and vulnerable) portions of our community. We would become indistinguishable from Arcadia. All of which would never have happened had the General Plan Update been allowed to go through in 18 months as originally planned. Instead it was deliberately delayed by a venal City Hall far more concerned with the revenues it would receive through massive development impact fees than the wishes of the citizenry whose taxes pay their salaries. In my opinion each city employee complicit in selling out the taxpayers of Sierra Madre by deliberately delaying the completion of the General Plan Update needs to be relieved of their jobs and sent packing. An outside investigation into why this happened should be conducted as well to make certain nothing criminal occurred. What MaryAnn MacGillivray, Don Watts and Kurt Zimmerman had in mind when they first began discussing an update to our General Plan in 2009 was just that. Protecting our community from just these kinds of overdevelopment threats. All three had recognized what our vulnerabilities are, and what the consequences to this community could be. They set out to fix them, but then ran out of time. Today we're paying the price. Those who did all they could to delay the completion of that effort, and with considerable success I might add, did so in order to open up this town up to the kinds of overdevelopment problems we are currently facing. And will continue to face when the Mater Dolorosa and Stone House McMansion projects come on line. And yes, it has always been about the money. We wanted to preserve Sierra Madre. City Hall wanted to sell us out in order to line the pockets of their development, corporate, union and utility cronies. Not to mention funding their own personal pensions and benefits. All something we have yet to get past. In my mind that is a practice called corruption. Maybe CETT should change the name from Stone Gate to Fire Gate. Yes, we need to fast track the General Plan at this point. Can the city council approve the land use portion now, and bring the rest on board later? Does it really have to be approved all at once? What a picture. That was a hard time. This is a very incendiary post. The picture shows no houses should be built there. Why should firefighters risk their lives to save some dude's ugly McMansion? If you build a house in a high danger fire zone that is your business. But society should not be required to sacrifice its brave firefighters to save your property when the inevitable occurs. which picture? the fire or the 4 civility Councilmembers? notice how Buchanan just couldn't shut up while on the Council and had to educate us on how smart he was is completely silent these days and never shows up at Council meetings? 1:04. yikes those terrible memories of Buchanan! Remember how he used to sigh and take off his glasses to begin his 10 minute sermons on why we couldn't have real transparency in government, or slow growth or protections of any enforceable kind? Such a pretentious verbose condescending fraud. I'm sure that is the cadence John Buchanan uses at Edison when he fires people. 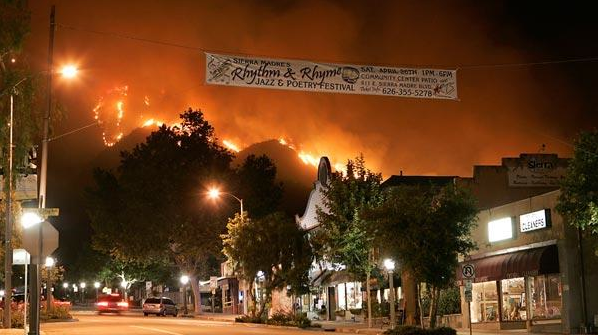 1:04, both pictures show disasters to our little town. Joe Mosca fled the country, Nancy lost her mind, Josh vanished, but John Buchanan is still around and lurking about. 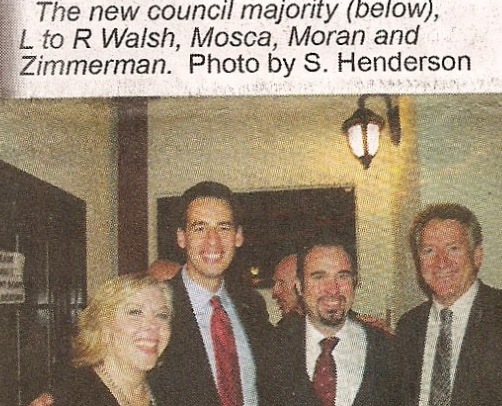 Joe Mosca left town abruptly right after the Matheson scandal hit? He had a lot to gain in financial windfall from developers had he stayed around. Very strange. The city manager and the director of developers did not want the general plan to be done by citizens. They both wanted to farm it out for a half a million, and were resentful the whole time that the volunteer committee was doing it. If true, their petty jealousy could cost us a lot of money. If Mayors Buchanan, Mosca, Moran or Walsh had wanted the General Plan update done, they could have pushed it through. They didn't do that. You have to ask why. Moran's mama is a Realtor. Once again, nothing to see here! Carry a big stick and bring marshmallows. 4 wasted years, and now we are going to be paying the cost. We are cleaning up their mess. So appalling I can't even come up with a joke. Apparently our mountains aren't the only things that got burnt. Buchanan and Zimmerman aren't even from the same planet. Maybe Buchanan should pay the legal costs of the CETT lawsuit. After all, he set us up for this. For that matter, 1:45, Rob Stockly, Buchanan, Torres and Joffee should all be on the hook - but they are not. Council members are protected and they get to have the city law firm work for them at no cost. It is a sweet deal. We pay for the lawyers that they use to protect themselves from us. The General Plan should have be put to rest by now. It should be the law of the land. It was delayed on purpose by Elaine and Danny. The delay has brought thousands of dollars into the city coffers for their salary, benefits, and retirement. The inaction has left use with some really ugly development. Thanks Danny and Elaine. Staff started stalling at the first meeting of the General Plan. The first year the committee met less tahn 5 times. Staff did not want the General Plan to be a vision of the people. They wanted it to be a vision of SCAG. Remember how hard it was to get Susan Werner for get on board with the "granny flats?" It was like pulling teeth. The Council should finish the review this week. Then we must keep the pressure on to get the EIR completed. Staff will work with the consultant to delay that. Delays will further ruin the town. That is why staff needs to be fired. They have put Sierra Madre in harm's way, and for selfish reasons. 2) I figure hillside development will give me a good fire wall. You can't argue with stupid. I don't see how McMansions can be considered a firewall. Wouldn't a pile of lumber that big make a fire bridge? Kind of like kindling to ignite the rest of the town? Let's hope we never have to find out if those streets can even be defended. They are narrow and since it'll be full of squeezed in MacMansions with not enough parking, some of the many excess cars will be on the streets. Not a safe situation for anyone. This was discussed over the years, but not to any effect. Personally, I hope the cops enforce the no parking rules. That is one of the few things the SMPD knows how to do. Parking is allowed except for a small portion at the entrance. Oh yes the Take you Out Speech. I remember it well. It was one of Nancy's finest moments only to be topped by her latest rant. I have heard that after the latest Nancy Broadcast she resigned from the Chanber and all of her other boards. Guess Nancy took herself out. LOL Funny thing is everything that she tried to get though has either failed or be redone. The rumor I heard is that Noah Green remained lotal to Nancy and walked out of the Chamber as well. Yet another insult to the beleaguered Ms. Walsh. Walsh was not at the Women's Club prayer breakfast last month. What other activities has she dropped out of? Didn't see her shopping at Shop Local Saturday last week either. I've heard she quit everything. The trashing she got from John Harabedian in the Looney Views News apparently put a big hurt on the poor thing.